One is nearer God's heart in a garden..yep, even a city garden. Next Tuesday's Song-ography title suggestion is "Scenes from an Italian Restaurant" by Billy Joel. That shot is perfect in B&W! Beautiful old fence, captured beautifully! I agree with you. Nicely done. Love the old weathered wood of the fence...I hope god is not listening in when I swear like no tomorrow trying to get rid of my stubborn weeds. Very creative shot ~ that weathered fence is a great focus! Wonderful B&W, love the plaque. I hope you are enjoying some sun today. Kewelopolis! I wish I could find a metal sign with a saying and hang it on our garden fence too. Totally cool idea! I'm not sure that it would stay there without being taken by a person passing by though. Patio tables and chairs are tied down with chains and metal locks in front of restaurants in some areas here in Illinois. Oh well. I'll try it and see what happens. This photo and verse just brought a very poignant memory flashing back to me. I don't want to share it, just to say "thank you" for prompting it. I love the photo. What a pretty and unique shot. Great shot and what a wicked cool sign! What a wonderful shot. Such a great fence and that sign is a treasure. The black/white really shows off the texture of that old weathered fence. Great light, as usual! Very rustic and very natural. That fence is wonderful. 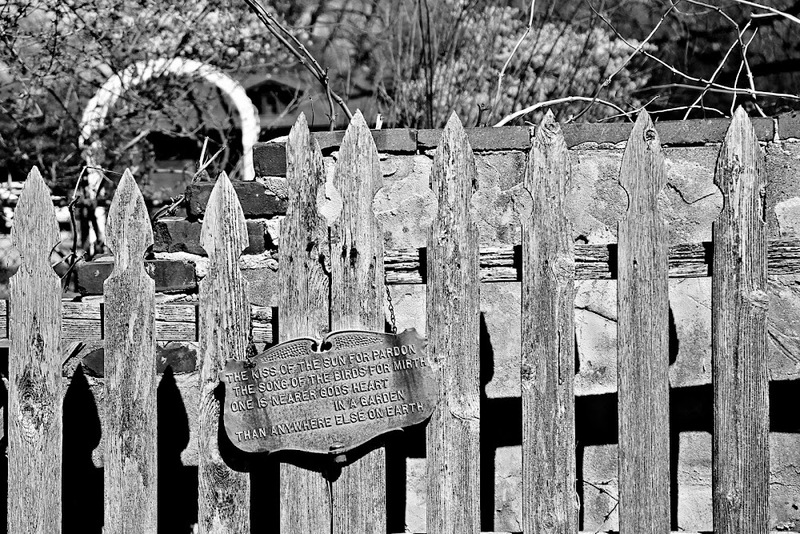 Your detail and b & w makes it seem like an old fence. love the natural feel captured. and the garden plaque is perfect. I love this pic and that little plaque with the saying is a perfect addition to the fence! Beautiful! Love this so much, I pinned it. Thanks for sharing with the Thursday Blog Hop! Totally agree. I can be close to a foul mood, step outdoors and feel so much improved. I love to happen upon a city garden. Gorgeous shot! Love that you chose black and white for it. I for one certainly feel close to God when I am in a garden! Love the photo, especially the weathered picket fence. Thanks for sharing with SYC.